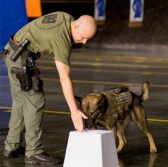 Johns Hopkins University Applied Physics Laboratory has developed and licensed a tool for training canine teams to detect peroxide-based homemade explosives. APL said Monday it granted Gallant Technologies rights to produce and market the government-funded canine training aid through a licensing agreement. “Technologies like these will help prevent and deter devastating attacks, and facilitate the ongoing development of new sensors and preventive measures,” said Heather Curran, technology and marketing manager within APL’s Office of Technology Transfer. The laboratory rendered pure and detonable inert explosives through a patented technique that does not generate odor that can potentially confuse canine handlers. Gallant received approval from the Transportation Department for the unrestricted shipping of the training aids. The company has delivered small quantities of the technology to law enforcement agencies, research groups and independent quality assurance laboratories.